Yonatan Levin started Android Academy Tel Aviv about three years ago when he wanted to learn more about Android and figured that the best way to do so was through teaching. He also believes that knowledge should be free for everyone. Currently, the community has over 1,700 members. In an interview, Yonatan told us how and why he is involved in his community. So, you really seem to love Android. Why? In Israel, Android and iPhone ratio is approx. 3:2, but that’s not why I like Android. I like how Google communicates new technologies through developers. We’re the best messengers, right? I also like open source. It’s a state of mind that I love. The ecosystem is big, but it’s comprised of developers who help each other. It’s like being on the light side of the force in Star Wars. How did you start the community, and was it successful from the beginning? When I decided to start the community, I approached Roy Glasberg at Google Campus with the idea. I prepared a long presentation, but after presenting it to him for five minutes, he told me to go for it. The first course we did was an Android Basics series. We had about 50 people but only half of them finished the course. Some were complete beginners to programming, and we had to teach them Java, so then people who had experience left. It was a learning experience for us. But then, people who finished the course spread the word, and we had 100 people for the second course. That’s a lot of people. What helped you get so much interest? The quality of the content was good, even compared to some paid courses, which were all expensive. Plus, as developers ourselves, we included useful real use cases. We even give ourselves feedback and improvement tips for presentations. When I say “we,” I mean Britt Barak, Idan Felix, Jonathan Yarkoni, and Muriel Felix together with me. Without their passion and effort, our community wouldn’t be where we are today. We also started using Study Jams materials. Instead of using it as a part of the course, we used it as homework material. We would then explain what they could do with what they learned with the Udacity contents, using real use cases. The combination worked like magic – 80 people out of 100 finished the course. For the third course we even had 300 registrations, but due to venue capacity, we only accepted 120 people. Your community is growing fast. Why do you think your community’s successful? First of all, it’s passion. Everyone’s very passionate about Android and what they are doing. The second reason is the content. We work very hard to make a good one. For example, it took two months to create one of our 1.5 hour presentations. We give presentations to each other before actually presenting to the community. Then we give feedback, so it takes a lot of time. The third reason is because we’re doing it on an ongoing basis. Everyone knows that it’s held once a month at the beginning of the month. Everyone’s busy, but they can come to the course because of that. Then, it’s people. You start to see the same people coming. We have mentors from our course coming to help, to be there, and to talk to people. They feel part of the community. It’s also about having fun and making people feel welcomed. If you come to the community for the first time, I approach you, talk to you, and make an effort to remember your name. I think it’s very important that people feel they’re part of the community. What’s the secret to keep your motivation? Aren’t there any challenges? Well, sometimes it’s hard to manage the time and to find strength to do all this stuff. I came to Israel alone when I was 16 and literally built everything from zero. So I believe taking action is a way to succeed. Sitting on a couch watching TV and complaining about the government doesn’t get you anywhere. If you don’t agree with something, you should get up and change it. Don’t ask anyone to change it for you. And for me, I want to know more. How can I do that? I can do this by helping others. I’ll tell you a story. At one of the courses, the second one I think, there was a woman. She had a career as a developer but she gave up on the career because she had a child and took maternity leave, etc. In the course, she worked hard and created an English learning app for her daughter who didn’t like to learn English. It was amazing and she won second place with the app. At that time, I was actually wondering if I wanted to do the course the year after because it was really hard. At the end of the course, the woman came to me and said, “Thank you, Yonatan, for showing me what I'm capable of.” That’s the reason why I'm doing this – to show others what they are capable of, and not being afraid of going. 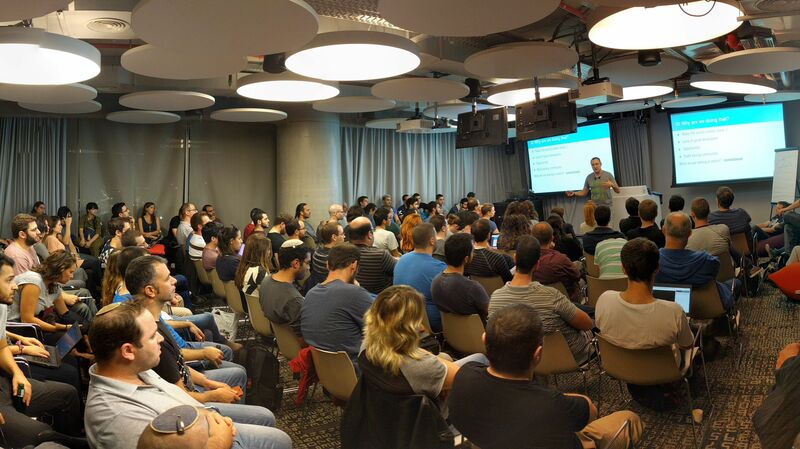 Android Academy Tel Aviv is running advanced an “Android Fundamentals” series, check their Meetup page for more details.